Histamine is a chemical that's normally produced in your body and stored in allergic cells, such as mast cells and basophils. If you have allergies, histamine is released from these cells in a response to allergens. Your histamine binds to the histamine receptor , which is present on various cells in your body and results in allergic symptoms such as sneezing, itchy eyes, itchy nose, hives, or even anaphylaxis. Antihistamines are medications that block the receptor for histamine, thereby stopping the symptoms that histamine causes like sneezing, runny nose, itchy eyes, and swollen throat. Hay fever (allergic rhinitis): Newer oral antihistamines, such as Xyzal (levocetirizine), Zyrtec (cetirizine), Allegra (fexofenadine), Clarinex (desloratadine), and Clarinex (desloratadine), are very effective therapies for the treatment of hay fever. Older antihistamines, like diphenhydramine (Benadryl), chlorpheniramine (Chlor-Trimeton), and hydroxyzine (Atarax), also work well but have many side effects. Oral antihistamines work well when they're taken as-needed, meaning that your allergy symptoms improve within an hour or two of taking the medication. Antihistamines are also available as nasal sprays for the treatment of allergic rhinitis (nasal allergies). Nasal antihistamine sprays include Astelin (azelastine) and Patanase (olopatadine). Corticosteroid nasal sprays are often used to treat allergies as well. Examples of these include Rhinocort (budesonide), Flonase (fluticasone propionate), Nasonex (mometasone), and Nasacort Allergy 24 Hour (triamcinolone). Eye allergies: Oral antihistamines can help treat the symptoms of eye allergies. They're also available as eye drops, such as Optivar (azelastine), Emadine (emedastine), Visine-A (pheniramine), and Alaway (ketotifen). Corticosteroid eye drops may be used to treat eye allergies when antihistamines don't work. Examples include Flarex (fluorometholone), Alrex (loteprednol), and Omnipred (prednisolone). Hives (urticaria): Oral antihistamines are the main treatment for hives. Newer, low-sedating antihistamines, such as Zyrtec or Claritin, are preferred over the older, sedating antihistamines such as Benadryl or Atarax. Topical antihistamine creams, present in many forms of over-the-counter anti-itch creams, should not be used for the treatment of hives or other skin allergies because using topical antihistamines on the skin, such as Benadryl cream, can cause contact dermatitis due to the antihistamine. Over-the-counter (OTC): Probably the most well-known oral antihistamine is Benadryl, which is an older, sedating antihistamine. While Benadryl is a reasonable medication for the treatment of various allergic conditions, side effects limit its routine use, especially during the daytime. Benadryl, and many other older antihistamines, such as Chlor-Trimeton (chlorpheniramine), are available OTC without a prescription. Newer, less-sedating antihistamines, Claritin, Allegra, and Zyrtec, are also available OTC without a prescription. These medications cause much less sedation and are therefore preferred over the older, sedating forms. Prescription only: While many older, sedating antihistamines are now available OTC, Atarax is still only available by prescription. Atarax is extremely sedating and is commonly prescribed for the treatment of skin allergies such as hives and itching. The active metabolite of Atarax, Zyrtec, is available OTC and causes much less sedation. Xyzal and Clarinex, two less sedating antihistamines, are still available only by prescription, as is Periactin (cyproheptadine). Older antihistamines, such as Benadryl and Atarax, have a significant amount of anticholinergic side effects, including dry mouth, drowsiness, constipation, headache, and urinary retention. Because of the side effects of these medications, they are generally considered to be too sedating for routine daytime use. Since older antihistamines can impair mental and motor functioning, they can diminish your ability to operate motor vehicles or heavy machinery. In fact, in many states, you can be charged with driving-under-the-influence (DUI) if you operate a motor vehicle while taking medications such as Benadryl. 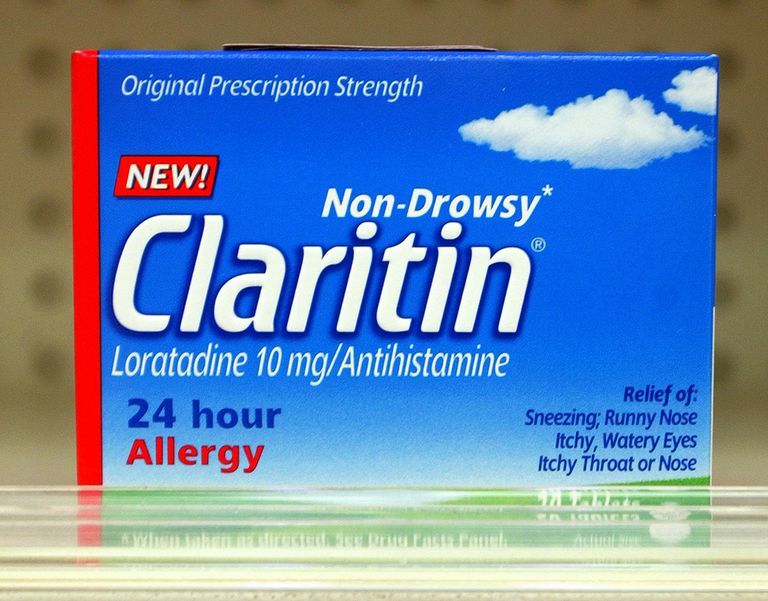 Newer, low-sedating antihistamines, such as Claritin and Zyrtec, tend to have fewer anticholinergic side effects. While these newer antihistamines may still cause drowsiness or a dry mouth, they haven’t been shown to impair your ability to operate a motor vehicle. Allegra is the only antihistamine that is truly considered to be non-sedating. In addition to sedation and dry mouth, antihistamines may have the unwanted side effect of increased appetite and weight gain. This may be due to the similar chemical structure of antihistamines and certain psychiatric medications, such as anti-depressants, which are known to increase appetite and lead to weight gain. In fact, numerous people who have used Xyzal reported an increase in appetite and weight gain. The package insert for Xyzal confirms weight gain as a known side effect but reports this as only occurring in 0.5 percent of people in studies who were taking this medication. Older antihistamines, such as Periactin (cyproheptadine), have actually been used for the purpose of increasing appetite and weight gain in underweight children and cancer patients undergoing chemotherapy. Mayo Clinic Staff. Allergy Medications: Know Your Options. Mayo Clinic. Updated June 6, 2017. Are Your Allergy Meds Causing You to Gain Weight? Should You Be Taking Claritin, Zyrtec, or Allegra? Why Don't Allegra and Fruit Juice Mix?